From a purely logical standpoint, the most useful tie you will own is a navy-blue club stripe. Followed by a brown or burgundy in the same pattern. The first reason is that a dark tie is more versatile than a pale tie. It is more sober, more business-like and, outside of work, can play the supporting role to more adventurous clothing combinations. Second, the most useful dark colour it can be in is navy blue. As with suits, which are most practical in the base colours of grey and blue, ties in either navy blue or silver are versatile enough to produce an outfit for an interview or presentation (try the classic blue suit and grey tie, or vice versa) and to combine with other patterns and colours. Both go easily with every colour of shirt (white, pink, blue and others) and most colours of suit. Navy, however, is more practical at anchoring adventurous patterns and colours in the suit or shirt. As explained in my theory on The Italian Background, a blue tie and blue shirt is often used by gentlemen of that country to accompany daring materials, such as tan gabardine, bold glen plaids and pale linens. Navy is more useful than grey. However, as the third leg of my argument, I would argue that a tie with a bold stripe is more practical than a plain one. It can accompany three other patterns (shirt, suit, handkerchief) or none. It can rise above patterned shirts and fairly bold pinstriped suits, its strength of pattern and contrast being almost impossible to match. And it is reserved and therefore multifaceted. Some may argue that a large-pattern club tie, with crests for example, would be more practical as it will never clash with the pattern of a shirt or suit; I would argue its occasions for wear are slightly more limited. For these reasons, a navy-blue club-stripe tie is most practical tie you can own. If you only own one tie, make it this one. Of course, few men are likely to be in that position. This is a slightly pointless argument. 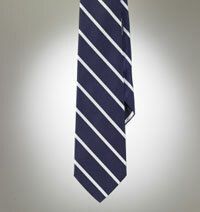 But it amuses me and, I hope, convinces some of the importance of both navy and club stripes in a tie collection. By the way, the English call it a club stripe because men wore it in the colours of their club to denote membership. A club tie normally means one with crests rather than stripes. In the US, these ties are normally known as repp ties. This, however, does not refer to the stripe but to the diagonal ribbing (from which repp is a corruption) of the silk. You can follow the discussion on Navy stripe: The most useful tie by entering your email address in the box below. You will then receive an email every time a new comment is added. These will also contain a link to a page where you can stop the alerts, and remove all of your related data from the site. Making clear the difference in terminology for us Yanks versus our European brothers is useful. Without it, even a simple term like “button down shirt” translates differently. i just saw Brian Williams with this tie and was looking for a place to buy it. Maybe his stylist reads your blog because I saw it right here. Cany you share with me where I can buy this tie. The tie is purple label Ralph Lauren, but Drakes also does a similar one that I would recommend.